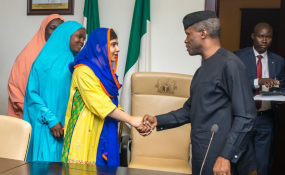 Abuja — Malala Yousafzai has said that though Nigeria is the richest country in Africa, it has more girls out of school than any country in the world. The education activist Malala Yousafzai who met during her visit to Nigeria with girls displaced by the Boko Haram crisis, said studies are clear that educating girls grows economies, reduces conflict and improves public health. She said, "For these girls and for their country's future, Nigeria's leaders must immediately prioritise education." This is even as the United Nations Children's Fund's (UNICEF) education response in the northeast remains critically underfunded, with just 54 per cent of the $31.4 million appeal received, leaving a funding gap of $14.4 million. While in Maiduguri, the epicenter of the crisis in northeast Nigeria, Malala visited schoolchildren in a camp for displaced families and secondary school girls at Yerwa Government Girls School. Over 2,295 teachers have been killed and 19,000 displaced, and almost 1,400 schools destroyed since the start of the Boko Haram insurgency in 2009. Three million children in the northeast are in need of support to keep learning. While the 90 camps and camp-like settings in Maiduguri house thousands of families, more than three-quarters of the 600,000-plus displaced people are living with family, relatives or friends in host communities, placing additional burden on local schools. Beyond the crisis in the northeast, Nigeria already had the largest number of children out of school in the world - over 10.5 million. Among primary school-aged children not in school, only five per cent are dropouts: three-quarters of them will never step foot in a classroom, and the majority are girls. Across West Africa, 46 per cent of primary school-aged children not in school are Nigerian. Globally, one in five children not enrolled are Nigerian. The UNICEF's Representative in Nigeria, Malick Fall said, "We will do everything in our power to make sure all children can keep learning. We believe that education - especially for girls, is the single most important way to bring hope, peace and prosperity not just for this generation, but also for future generations" . Malala Yousafzai is a Pakistani activist, student, UN Messenger of Peace and the youngest person ever awarded the Nobel Peace Prize.